Thank you, Eva, sounds really good, I am looking forward to it already! Count me and probably also Regina in! Thanks, dear Eva, for organizing this, thanks a lot. I would like to attend every single Leonard Cohen Event and Walking tour but unfortunately even in this 21st Century we still cannot say Beam me up Scotty!! Trips cost money and money is tight these days. I will keep buying the lottery tickets though. Majmunka, I still owe you for the beautiful unified heart. Please send a private message confirming your address and I will get the money to you. Apologies for delay. 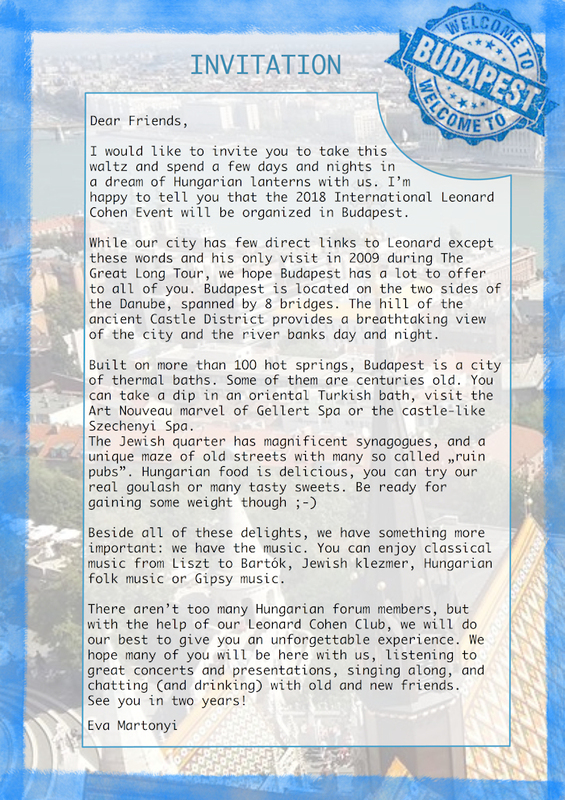 Do we have exact dates for the Budapest Event? Most probably the first or second weekend of August. I think we can announce the date soon after Hydra. It would be nice to attend one more gathering before I'm ashes. I glanced at airfares from San Francisco to Budapest and they're cheaper than I thought. I'll bet I can find accommodations pretty reasonable too. I'll start saving up. Have fun in Hydra everyone! (If I can pull this one off maybe a few old-timers would consider going...G? Cia? Jo? Tim? Pete? Bobbie? Really looking forward to the Budapest Event. Have visited Budapest once before, but for only a short time, so it will be great to get to know this lovely city better. Am definitely planning to come! Eva is an absolute delight. Such a dry sense of humour accompanies her great mind. I was so glad to talk with her on Hydra last week. Her organised event will be wonderful.